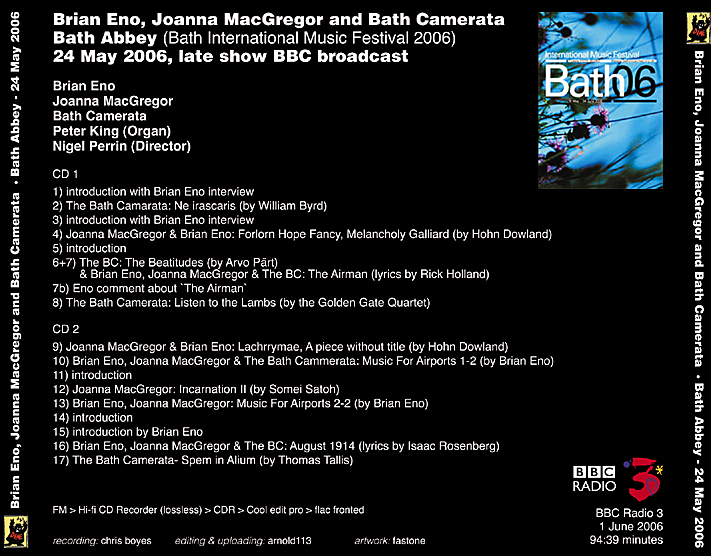 Live at the Bath International Music Festival 2006, May 24, 2006 (late show). Imagine Brian Eno tackling Arvo Part's The Beautitudes - a collusion of the ambient and the ancient. 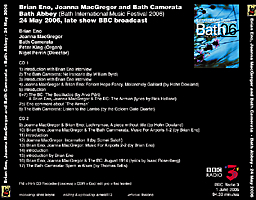 As the artistic director of Britain's Bath's Festival, pianist/auteur Joanna MacGregor had invited electronic maestro Brian Eno to perform at the 2006 Festival. 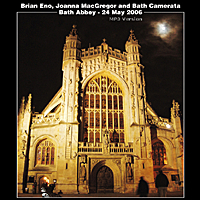 With the choir of Bath Camerata in attendance, the show is both meditative and interesting. As The Independent newspaper reported: "Seated at a desk (looking rather like a newsreader in his grey suit and specs, Apple Powerbook open in front of him), Eno made announcements, intoned poetry in his impressive, actor-ish voice, and even sang along with the choir. By twiddling a little console connected to the computer, he also 'treated' MacGregor's Steinway and the voices of the choir with the sonic shivers and shimmers - a kind of audio-ectoplasm - that characterise his famous ambient works. "In the most compelling sequence of a wonderfully varied programme, MacGregor's Eno-ised version of Dowland's Lachrymae - slowed-down to ambient-tempo - was followed by selections from Eno's own Music For Airports. With the members of the choir now dotted about the abbey (a feature of the performance), their wordless vocals, combined with Eno's effects and the airy acoustic of the building - plus subtle lighting and fan-vaulting a go-go - created a powerful, indeed unforgettable, impression." Thanks to arnold113 for sharing the lossless version of this FM radio broadcast on the internet. Arnold113 also noted the following: "Thanks to Chris Boyes, who was so kind to send me a CDR copy of his recording of this very concert. 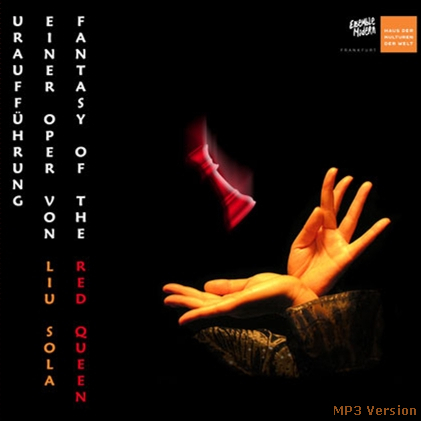 Please notice that I patched together Track 6 and 7 (Disc 1) which were performed that way morphing into each other. I didn't like the way the two tracks were rudely chopped up by the BBC. The Eno comment about The Airman I put AFTER the very song, I hope you will prefer this as well. One track was not broadcast - O Bone Jesu, performed by the Bath Camarata (by James MacMillan), performed before August 1914." Thanks also to fastone for the artwork. Note: Kindly be patient when taking the songs. Please email us at mybigo@bigozine.com if you encounter problems downloading the tracks.